Crystal AirCruises’ fully customised Boeing 777 has been christened Crystal Skye at an event at McCarran International Airport in Las Vegas, Nevada. Presiding over the christening of this ground-breaking vessel alongside chairman of Genting Hong Kong, Tan Sri Kok Thay Lim, and Crystal president, Edie Rodriguez, was Crystal Skye’s godfather, Matthew Upchurch. Upchurch has long been renowned as a visionary in travel, spending much of his esteemed career specialising in the luxury realm. In his role as chief executive of Virtuoso, one of the world’s leading luxury travel networks, Upchurch has collaborated closely with Crystal and its partners to deliver exclusive travel experiences throughout the world. The ceremony reached far beyond the guests attending, as Crystal live streamed the occasion via its Facebook Live feed, effectively welcoming travellers from all over the globe to witness Crystal Skye’s debut. Rodriguez and Upchurch both expressed sentiments of appreciation for the massive collaboration executed by all teams involved in the creation of the ground-breaking aircraft, as well the outlook for Crystal Skye’s significance to the travel industry overall. 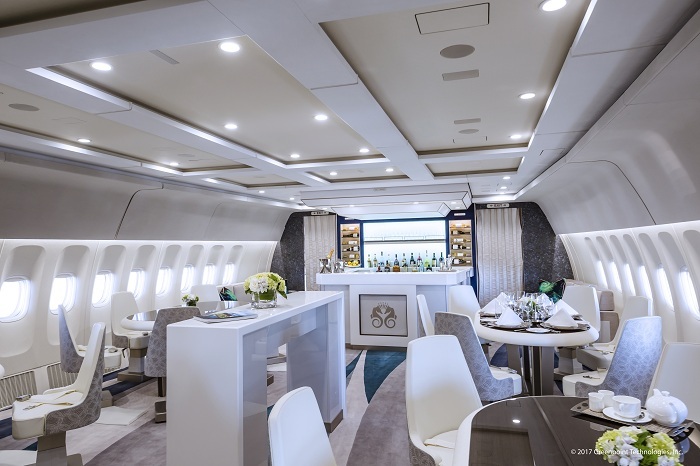 Following their remarks and the breaking of champagne against the aircraft’s hull, Rodriguez welcomed guests aboard Crystal Skye to see the signature design touches and luxurious space first hand. “As Crystal continues to innovate new experiences that appeal to a growing audience of luxury travellers around the world, we are proud to support the vision and ambition shared by Edie Rodriguez and all the experts at Crystal, and we celebrate the milestone of Crystal Skye’s introduction to the world,” said Tan Sri KT Lim. With a spacious design for up to 88 guests, Crystal Skye is appointed with features rarely found in even the most luxurious private jets. She has the highest crew to passenger ratio of any twin-aisle aircraft and a non-stop range of 19.5 hours, allowing travellers to explore the far reaches of the earth while enjoying the personalised service for which Crystal is renowned worldwide. Bespoke Crystal Exclusive Class seats are designed for maximum personal space and ergonomic comfort, and convert to 180-degree lie-flat beds. The expansive social lounge with stand-up bar fosters friendly camaraderie among luxury travellers. Cuisine will be prepared by an executive chef, in two state-of-the-art galleys and paired with an elegant premium wine list from the Crystal SkyeCellar.